We arrived in Vienna in the evening (later than planned as our connecting flight from Warsaw had been cancelled and our replacement flight then delayed). We were staying in a lovely Airbnb near Volkstheatre (just at the edge of historic Vienna). Worn out from a day of travel, we decided to forego exploring our first night and begin our trip the following dayOur first day in Vienna was a Sunday, which meant most of the city was quiet. While many tourist attractions and restaurants were still open, Austria is in favour of giving its shop keeps a day off on Sunday. A custom, which, while I found an odd adjustment, I believe North America would do well to adopt. Sundays are, after all the finest day of the week, invented for brunching and perusing markets for fresh flowers. I was lucky enough to visit not one, but two beautiful libraries whilst in Austria. Each beautiful in very different ways (be sure to stay tuned for the second, it’s one of the many reasons I have longed to visit Austria for years!) The Great Hall of Austria’s National Library is stunning, once owned by the Habsburgs (Marie Antoinette was one, before being married off to France). 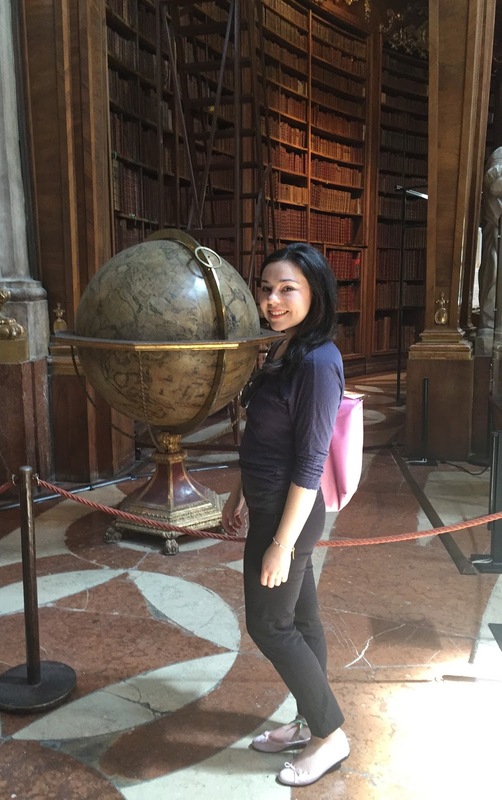 It is filled with beautiful ancient globes of the world, as well as massive books (I can only assume these must be world maps) as well as thousands of books. The decor is Baroque, sigh. Vienna is a darling city. 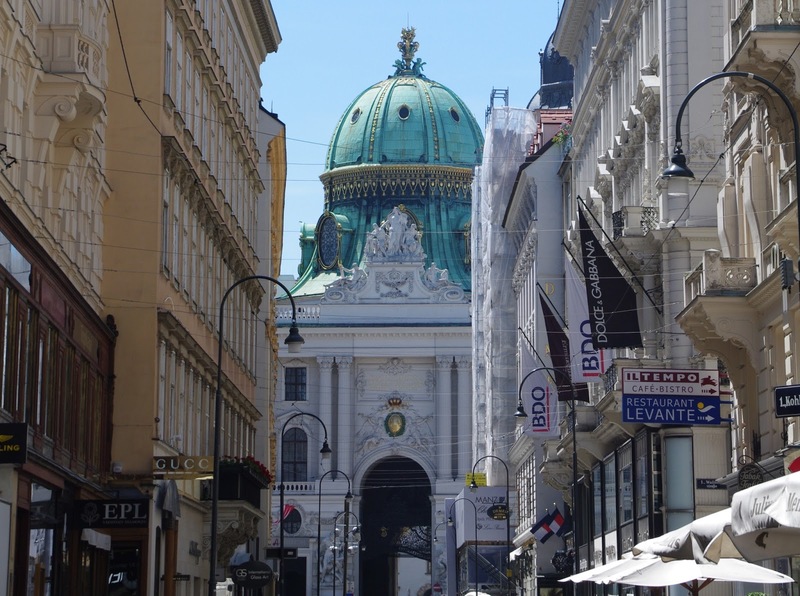 I adore the sea green accents of the tarnished copper found on dome of the Hofburg Palace, in Vienna’s main square. Sunday is a great day to walk around the old city. It’s almost still. We had breakfast on the patio within the court of the Hofburg Palace. Before departing on my trip I met an Austrian lady whose advice I sought regarding her country. Her parting words were, “Don’t worry about your waistline”. I had these words in mind when I ordered a Melange at my first meal in Austria, coffee & steamed milk topped with whipped cream! Prater, the amusement park outside the city centre, is much like a permanent fairgrounds. By far the most iconic ride being the Wiener Riesenrad ferris wheel, which can be seen arching above the trees, a fair distance from the park. The wheel is made up of small boxes, within which one can dine by candlelight! Unfortunately I didn’t indulge in this unique experience this trip, but I assure you it’s on the list next time I’m in Vienna! Prater has no entrance fee and tickets are purchased directly at each ride. I did manage to go on a more conventional ferris wheel, which gives a nice view of the city and Prater park. Following the Prater we stopped off at Demel, Vienna’s café, established in 1786 for hot chocolate and apfelstrudel. Demel has long been the spot for Vienna’s ladies who lunch to gather for confections and mugs of hot chocolate. Even Vienna’s beloved Empress, Elisabeth of Austria, known famously for her strict diet and svelte figure had a weakness for their candied violets. On the walk back to our Airbnb we stumbled upon this garden of rose bushes, there had to be fifty of them, in any colour of roses you could imagine. It was absolutely beautiful and so magical to find them! I felt like Alice in Wonderland, wandering through the gardens of the Queen of Hearts. To culminate the first night in Austria we dined at Figlmüeller, the home of Wienerschnitzel! Unfortunately the original location was full and the the second location at a line out the door, but we eventually got a seat upstairs (a really cute location). Despite not getting in at the original location, we still ordered the original schnitzel, a recipe which Figlmüeller has been perfecting for over 110 years! We each ordered our own schnitzel and a salad to share. The schnitzel is definitely a dish which can be shared between two people, which we realized when the table next to us received their order! The salad came with delicious Viennese potato salad…I have been trying to recreate it since returning home!